When should you do your Christmas shopping? It is a mild weekday in late October, and mother and daughter Julie Pasifull and Abby Forster are already Christmas shopping on Oxford Street. Abby says they are doing it now because "leaving it to the last minute is a lot more stressful and all the good stuff tends to go". She adds that they have actually been browsing for gifts and decorations since August. 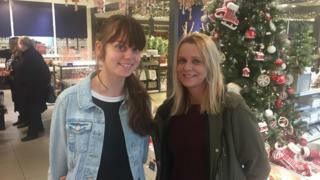 Another shopper, Alexis Beldam from Stevenage, says she "would rather do it in one big hit so I don't have to worry about it anymore". "If you've got the money it makes sense to do it early," she says. In truth, most of us still prefer to do our shopping nearer to Christmas, and research from PwC suggests the busiest shopping day of the season will be 23 December this year. However, there is also evidence to suggest the festive shopping period has been starting earlier in recent years. In 2015 supermarkets Morrisons and Asda both premiered their Christmas TV ads earlier in November than in 2014, to reflect consumer and sector trends. And John Lewis and Lidl told the BBC that their shoppers start browsing for Christmas goods in September. Image caption Alexis Beldam likes to do her Christmas shopping "in one big hit"
Moreover, in 2014 the Royal Statistical Society found that Brits were starting to think about Christmas in late August, around three months earlier than in 2007. "We often complain about the Christmas creep but the fact is many shoppers are looking to spread the cost while others simply want to get their shopping done early," says Natalie Berg, an analyst at Planet Retail. "Now it's common to see Christmas merchandise on shelves by 1 October," she adds. Other factors are driving us to buy earlier too, she says, though perhaps not as early as August - the biggest being the huge discount sale Black Friday and its online cousin Cyber Monday in late November. The sales, which originated in America and have grown in popularity in the UK over the last few years, are now some retailers' biggest day of trade of the year - not to mention a perfect opportunity to pick up Christmas bargains. "Christmas goods may be on the shelves but shoppers have been trained to wait for discounts," says Mrs Berg. "In fact, many shoppers today know that the first half of November is actually the worst time to buy for Christmas because everything will go on sale on Black Friday." The trend is borne out by retailers' sales figures, says Andy Mulcahy, head of e-logistics at retail analysts IMRG. "In the years following the economic crash in 2008, we tracked a trend for Christmas shopping starting earlier... so that people could spread the costs over a longer period. "But Black Friday has gradually changed that. For the past two years, retailers have seen a slow start to Christmas trading, before condensing high volumes of orders into a short time frame around late November." Black Friday may not be your last opportunity to snag a bargain before Christmas, though. In fact, weaker-than-expected sales last year prompted some retailers to bring forward their January sales to 19 December, so called "panic Saturday". However, there may be another incentive to get our shopping done earlier in 2016 - the threat of looming inflation linked to the recent fall in the value of the pound. Since Britain voted to leave the EU, sterling is down by around a fifth against the dollar, raising the cost of imported goods. Notably, Tesco temporarily halted online sales of brands such as Marmite in October after manufacturer Unilever tried to raise its prices by about 10%, blaming currency trends. But while Mrs Berg believes this will be in some consumers' minds in the run-up to Christmas, in reality price rises for most goods are not likely to be passed on to consumers until 2017. Kien Tan, a retail expert at PwC, agrees. "Many of the gifts that we will buy over the Christmas period - things like toys and clothes - will have been ordered by retailers much earlier in the year, so will not have been affected by the falling pound," he says. "And, even though inflation rose by 1% in September, the price of groceries actually fell because of the intense competition between supermarkets to win our custom. "So we don't think inflation will affect our Christmas shopping plans this year." Perhaps not surprisingly, retailers the BBC spoke to declined to say whether they would put up prices before Christmas. However, it looks like at least some goods and services will be more expensive by then. In October, the Wine and Spirit Trade Association warned that wine importers, merchants and retailers were already starting to see profits squeezed by the weak pound. And online wine retailer Naked Wines said it would raise the cost of its wine by 5% from November because of increasing import costs linked to sterling. Mrs Berg does not expect retailers to put up prices for most goods in January because customers have come to expect the January sales. However, with inflation widely expected to breach the Bank of England's 2% target in early 2017, we will almost certainly be feeling the pinch by next February or March, she says. According to Mr Tan, it is "inevitable" that many things we buy from abroad will be affected - from food to clothing to electronic goods. And for shoppers on Oxford Street that is concerning. Bev from Manchester says she is worried about prices rising next year because her wages "aren't keeping up". Another, Josie, says she "will probably be affected because I plan to retire next year, so it is worrying". With Christmas likely to be considerably more expensive in 2017, the incentive to shop early is only going to get stronger, it seems.